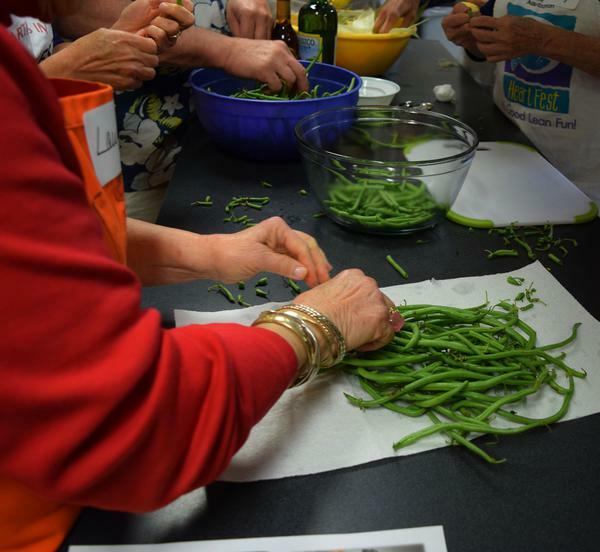 Introducing locally grown, caught, or raised food into your nutrition education and cooking classes can be a fun way to engage class participants and get them interested in eating fresh, healthy food. Doing this requires a combination of planning ahead and being able to adapt on the fly. 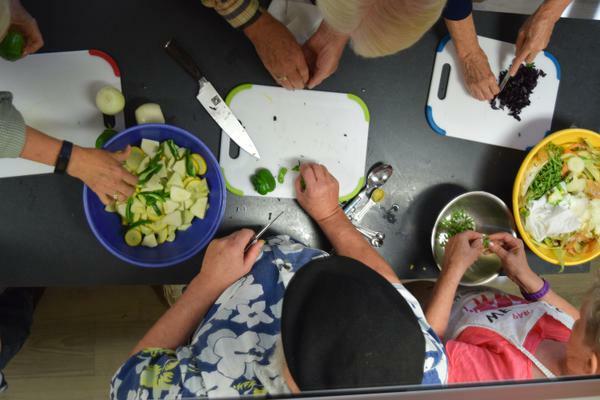 This guide is designed to help you think through how you could incorporate local food into your nutrition education and cooking classes, and it also gives you some tips for making local food a part of the educational experience. While we want to promote local food as a tool for healthy eating and to support local farmers, it is important to note that local food isn’t necessarily healthier than nonlocal food. Eating healthily is our first priority, whether that’s eating canned, frozen, or fresh products. However, if people get excited about learning where their food comes from, they may be more likely to eat fruits and vegetables, which is a great step toward a healthy lifestyle. See section 1 under the Additional Resources links at the end of this document for more information about the benefits and impacts of local food. Not all the food you use in your programs has to be local. Consider highlighting one regional or seasonal specialty and use that opportunity to talk a little about local agriculture and sources of local food in your area. It might be helpful to invite your N.C. Cooperative Extension agriculture or horticulture agent to talk to your class about agriculture in your county and region. Use the section 2 link under Additional Resources to download an infographic about agriculture in your county. Become knowledgeable about harvest times for fruits and vegetables in your region and plan your recipes accordingly. A couple of great places to start are the availability charts from the North Carolina Department of Agriculture & Consumer Services (NCDA&CS) and the NC 10% Campaign. The NC 10% Campaign encourages North Carolinians to spend at least 10 percent of their food dollars locally. You can find both groups’ websites under section 3 in Additional Resources. Although seasonality charts are helpful, remember that they do not take into account regional variation. The best way to learn what’s in season in your area at different times of the year is to visit your local farmers’ market or farm stand, or become a Community Supported Agriculture (CSA) member. Your local agriculture or horticulture agent is also a great resource. Community Supported Agriculture (CSA) is a system in which a farmer sells “shares” at the beginning of the season, and the customer receives a box of food every week during the growing season. Some businesses also sell boxes of produce without requiring the upfront payment; these businesses often provide online ordering and delivery. They tend to purchase from multiple farmers and might have more flexibility in ordering and payment. You can purchase local fruits and vegetables for your classes from many venues. The farmers’ market is an easy place to start, but don’t forget about roadside stands, Community Supported Agriculture (CSA), and grocery stores that promote local food. Some counties have access to locally produced food in cooperatives, independent grocery stores, or food hubs that allow direct purchasing. See section 4 under the Additional Resources links for directories of local food providers. Consider alternate sources of local food if you are on a tight budget. Can you coordinate with Extension Master Gardeners in your county to help facilitate donations from community gardens, or ask them to grow products in their demonstration gardens that you can use in classes? You may also want to form a relationship with a school garden or connect directly with a farmer. Some farmers may even donate a box of produce, especially if you offer to share information about their farm with your class participants. However, many farmers can’t afford the luxury of not selling their product, so remember to be considerate of their need to run a profitable business. When you cook with local food, you may not know what’s available until the last minute because harvest time can depend on factors such as weather and labor availability. Building a relationship with your source of local food (for example, a local farmer or farmers’ market manager) can help reduce this uncertainty, allowing you to find out ahead of time what they anticipate will be available the day of the class. Using a recipe finder such as the USDA’s Mixing Bowl can help you find recipes based on the ingredients that you have at hand, which can help you plan at the last minute. See section 5 under Additional Resources for more links to recipes. When planning to cook local food, we often try to find recipes that use whatever is available at that moment. Another option is to choose a recipe and see how you can adapt it to accommodate seasonal items. For example, if you were making pesto, you could substitute arugula, kale, garlic scapes, or celery leaf for basil. Frittata recipes can also be easily adapted to include whatever vegetables are in season. Encouraging class participants to adapt to the seasons is a great way to get them to be creative in the kitchen and build their confidence. Before the class or event, bring yourself up to speed on the nutritional value, storage guidelines, and standard preparation methods for the locally produced food you are showcasing. See section 6 under the Additional Resources for more information. Check on your county’s protocol for reimbursement and have a plan for obtaining receipts. Farmers at a farmers’ market or through a CSA may not be used to providing receipts, so communicate with them ahead of time. When planning your class, remember to think about the hours of operation of local food venues. Many farmers’ markets are only open one or two days a week, with limited hours. CSAs are often only available for pick-up or drop-off one day a week within a limited time frame. Either plan your class around when you know you’ll be able to get local food, or choose your local food market based on when your classes are scheduled. If you get a CSA box, it may not have enough quantities of each product to create a meal for your whole class because you often get a variety of produce depending on what’s in season and ready to harvest that week. Consider supplementing items that you need from a grocery store that sells local food, or, if needed, supplement with nonlocal items. Businesses that sell produce boxes will have more flexibility and may allow you to order larger quantities of individual items. Many grocery stores offer and promote local food items and can be a great source of local food for your classes. Items are often clearly marked as local, but ask to speak to the produce manager if you have any doubts. Expressing your interest in local food to the produce manager is also a great way to let the store know that there is consumer demand for local food. The freezer and nut aisle at your grocery store may also include North Carolina products. Fruits and vegetables come in many more varieties than what we’re used to seeing in grocery stores. Learn about the varieties of fruits, vegetables, and other local products that are available in your region, and discover how these varieties may vary in flavor and cooking options. You may find some varieties from local growers that are not available at the grocery store. Allow participants to see and taste the difference between local and nonlocal produce. For example, celery and carrot varieties that are grown locally have a much stronger flavor than those found in the store, while local tomatoes and strawberries may be sweeter because they are picked at the peak of ripeness. Remember to think about items beyond produce. For example, are there local honey producers in your area? Can you purchase North Carolina seafood or farm-raised fish in your county? What about locally raised meat? Local meat is usually sold frozen and may be available year-round. Try to establish a relationship with a local farmer. Some growers may sell directly to you, even in the off-season when your local farmers’ market may not be operating. Acknowledge the farmers you purchase from when demonstrating or cooking their products and, if possible, talk about their farm operation and/or invite the farmer to talk to your class about his or her farm. If your class is interested, consider setting up a farm tour so they can learn more about where their food comes from. Farm visits are educational, build awareness about agriculture more generally, and will help you develop strong connections to growers. Ask class participants to share their experiences and memories of fruits and vegetables from when they were growing up, and ask whether they currently grow any items themselves. Heirloom and heritage varieties of fruits, vegetables, and meat may remind participants of the foods they ate when they were kids. Sharing memories and family recipes is a great way for people to connect with one another and to be more mindful of their food and food choices, while also giving you the opportunity to respect and recognize different cultural backgrounds and experiences. Consider incorporating a farmers’ market tour into your nutrition education or cooking class to expose your class participants to this local food venue. A how-to guide and farmers’ market recipe cards are available to help you plan and implement your tour (see section 7 under Additional Resources). Let your class know about the NC 10% Campaign, which challenges consumers to commit 10 percent of their food dollar to local food purchases. Consumers can track their local purchases online and use the NC 10% Campaign website to locate businesses that support local food. The 10% Campaign also has resources such as a seasonality chart, tote bags, and shopping lists that you can give to your classes (see section 8 under Additional Resources). Learn about your area’s current growing conditions and find out how they are impacting the bounty of local produce. For example, does drought, cold weather, or excess rain impact what’s available at your local farmers’ market? The best way to find out about current conditions is to talk to a farmer at a market or to hear from your Cooperative Extension agriculture or horticulture agent. This website is by The Center for Environmental Farming Systems, which is a partnership of North Carolina Agricultural and Technical State University, the North Carolina Department of Agriculture & Consumer Services, and NC State University. NC Farm Fresh is a resource maintained by the NC Department of Agriculture & Consumer Services. If you click on “Visit an NC Farm Fresh Farm,” you can access information on nearby farms that may include CSAs, you-pick operations, or other local food markets. The North Carolina Directory of Farmers’ Markets, Roadside Stands, and Produce Markets is maintained by the NC Division of Public Health. This resource also includes information about each outlet in the directory, such as what method of payment is accepted (for example, cash, credit cards, debit cards, SNAP, or WIC). This resource allows you to identify partners in the NC 10% Campaign, including grocery stores and restaurants, that have pledged to source 10 percent of their products locally. This resource identifies local farms, farmers’ markets, restaurants, grocery stores/coops, pick-your-own, and farm stands, among others. The USDA maintains a separate national directory each for: farmers’ markets, on-farm markets, CSAs, and food hubs.